Local East Holmes Co., Ohio, residents are familiar with the unusual round log barn located on the south side of county road 135 between Berlin and Walnut Creek. 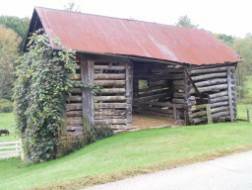 Although it has been deteriorating for several decades, this historic landmark will soon be undergoing restoration by a group of descendants of the likely original builder of the barn, Michel Yoder. Yoder settled in eastern Holmes County in 1845. He is the forefather of most of the area Yoders, especially those with Amish heritage. The restoration began this spring and is being headed up by builder, Andy C. Yoder, who is a descendant of Michel's. 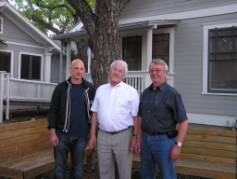 The lumber for the project will be partially donated by Dennis Raber of Raber Lumber. Restoration of this barn will represent the first preserved Amish structure in the area which has the largest Amish settlement in the world. Michel was born on November 4, 1788, in the southwestern part of Germany where his father Samuel was bishop of the Amish Mennonite Church in that area. The family had migrated into Germany from Switzerland some generations earlier around 1700. If you travel east from this barn on County Road 135, on a hill on the north side of the road you'll see the old cemetery where Michel and his wife Magdalena are buried. In Germany, Michel worked in a grain grinding mill known as the Weitzenderfer Mill. This mill was still in operation as late as the mid 1950's. In 1825, at the age of 36 he packed up a few belongings and along with his wife Magdalena and their two sons left on a sailing vessel for the "New World". After sailing for 77 days, they landed in Baltimore on September 31, 1825. The story handed down within the family is that their youngest son John learned to walk on the deck of the ship during the voyage. After the long journey Michel and the family were almost out of food and money. He had to leave his wife and children with authorities at the dock as collateral while he sought out some friends and returned with the money needed to pay for their passage. From there the family made their way to Somerset County Pennsylvania, where they lived for twenty years before moving to Holmes county in 1845. Much of the history and lineage of Michel Yoder has been preserved through the careful historical recordings in the Descendants of Michel Yoder a genealogy book that is currently in its fourth printing. The original passport is also preserved within the family. On the passport Michel's physical description includes: "Nasse: Gross". This translates as "Nose: Large", a characteristic still portrayed by many of his descendants. Various letters exchanged by Michel's father Samuel to his family in America are also preserved as are many of the meager belongings the family brought with them to the "New World". (See the article on the Samuel Yoder letters in YNL 9). Included among these treasured belongings are: a 1744 edition of a Froschauer Bible printed in Switzerland which includes not only Michel's but also his father Samuel's signatures; a 1780 edition of the Ausbund, an early Amish hymnal still in print after 400 years and still in use by the Amish; a pair of wrought iron scissors reportedly used by Michel at the mill where he worked in Germany; and an old charcoal burning laundry iron. Hopefully this rich historical heritage will come to mind as you travel along county road 135 and pass this unique treasured landmark. Anyone wishing to donate money for this project can send a check along to: The Yoder Barn, c/o Bert Yoder, 5613 Twp Rd 401, Millersburg, Ohio 44654 . If you have questions, call Mahlon Yoder, 330-897-8027 or write: marac5z1@verizon.net . (NOTE: The YNL has contributed funds toward this effort and encourages our readers to support it as well). Among those joining the Yoder DNA project has been a young Yoder from Argentina, whose great-grandfather Abraham Yoder immigrated from Kiev, Ukraine (then part of Russia) in 1905. It is written in the European research of the late Karl Joder that the brothers of Oley Valley immigrants, Hans and Jost Yoder, had descendants who moved to Weidenthal on the Black Sea near Constanza in Rumania. (These brothers were named Nicolas and Caspar). One line of the Jotter branch from Eppstein settled for a time in Galacia (Ukraine). Mennonites from the Netherlands and Prussia established colonies in South Russia (present-day Ukraine) beginning in 1789. So we were hopeful that we might see evidence from the test of a common ancestor. However, the results did not match to the Steffisburg Joder profile. The testee indicates the family was of Ashkenazi Jewish origin (Yiddish speaking). In the US, there is a current day family whose name is spelled "Yuter". YNL contacts with members of the family back in the 1980s revealed they emigrated from Lithuania. Current information is available on the internet at: www.yuter.org , and traces the line to a Moshe Yuter, born circa 1775, in Raguva (Rogova), Lithuania. Members of this family are known to have immigrated to the United States and South Africa. Others are known to have perished in the holocaust. We are seeking a US Yuter male for DNA test to match against the Argentine family. A quick search of the 1920 census shows three records of "Yoders" who had been born in Russia- one in Indiana, one in Kansas, and one in New York. Two of these three are shown as either "Jewish" or speaking "Yiddish". We are not aware of any "Yoders" living today in the US who descend from these Jewish Russian immigrants, but there may well be some. 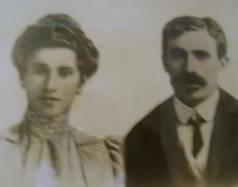 1920 Calif Census: -Henry age 42 and his wife Dorathea age 40, both born in Russia of Russian parentage. Their children are shown as: Sofia, 15; Dorathea, 8: and Christian, 5. They were living in Houghton, Fresno County, where Henry was a farmer on an Alfalfa Ranch. All but the youngest spoke German. With a child named "Christian" this family is more likely to have been connected to the Swiss Joders, but we don't know what happened to this family or how to connect them with any present day descendants. We hope to figure this out someday. Chris Yoder, Editor, Saugatuck, MI; John W. Yoder, Circulation Manager, Middlebury, IN; Rachel Kreider, Senior Contributing Editor, Goshen, IN; Esther E. Yoder, Mail Manager, Goshen, IN; Donald Kauffman, YNL Webmaster, Edmonton, Alberta, Canada. Other Contributors: Richard H. Yoder, Bechtelsville, PA; Dr. Don Yoder, Devon, PA; Neal D. Wilfong, Cleveland, NC. YNL INCREASES PRICE ! After 25 years we have finally decided to increase the subscription price for the Yoder Newsletter from $3 per year to $5 per year. This price is effective with renewals beginning with YNL50. Subscriptions already in effect will continue without adjustment. Please continue your support of the YNL! - ALL OTHER CORRESPONDENCE- Dealing with ancestral queries or contributions for future YNLs or archives (such as reunion notices, letters to the Editor, copies of Bible records or other historical information) to: Chris Yoder, 551 S. Maple St., Saugatuck, MI 49453 or email at cyoder@tds.net . -Annual YNL subscription (published Apr. and Oct.) for $5. -BACK ISSUES of the YNL are $2 per issue. Visit: http://www.yodernewsletter.org/subscrib.html for mail-in subscription form. YODER DATA ON DISK. Included back issues of YNL text, census and county records, family group data and pictures and scanned images. The price for our "Yoder Data on Disk" is $10 (postage included). Send to YNL address in Goshen. (Most of this info is also available free at the YNL Homepage). In YNL 46, we featured an article about Joseph Joder, "schoolmaster, farmer, poet". He was quite a unique individual and his biography had been featured in the 1929 annual publication of the Illinois State Historical Society. 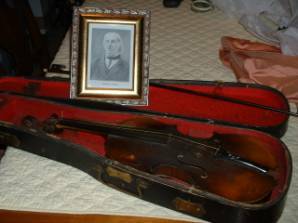 A couple of years ago, the YNL acquired a violin which had belonged to Joseph and was handed down through his great-grandson Francis Yoder Knapple. The HOUSE OF YODER has accepted our offer to display this relic, and it will join a life-size portrait of Cong. Samuel Yoder and an Oley Yoder Fractur also on loan from the YNL. 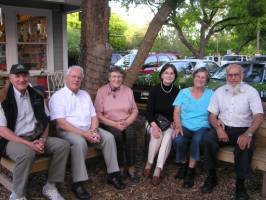 Hans Jakob Joder, accompanied by his wife Anna, a brother Ueli Guggisberg, and Edith Zimmermann Guggisberg visited their sister, Veronica & Julius Brunner in Lufkin, Texas, from April 5 through April 28, 2008 when they returned to Switzerland. So to make the trip worthwhile for the Yoders from Virginia, Paul and Ann flew to Austin to visit Ann's brother and family. While in Austin, their son Carlon (Yoder) came from Oakland, California, also to visit for the weekend of April 19-20 while the six people, (four of them from Steffisberg, Switzerland) came to Austin, Texas, and spent the weekend visiting several German museums and spending time visiting and eating together with the American Yoder distant relatives. WHO WILL SUCCEED TOM YODER? Sanderson, died Aug. 26, 2008 after a long illness. Floyd had been the only great grandchild of Bishop Christian Yoder Jr. to move back to western Pa. and Tom carried on the tradition of caretaking the Christian Yoder Cemeteries of Somerset Co., Pa. (See YNL 6, 8, 17 and 32 for info on his efforts). For years Tom made the round trip drive from Coraopolis to mow the gravesite, and when no longer able to do so, paid a local farmer to keep it nicely trimmed. Is there anyone who will pick up this role? What started as sort of a joke about 15 yrs ago continues to be an annual celebration of St. Yoder's Day. In a discussion of the holiday James L. Yoder and Stan Bohn decided it would be a fun thing to celebrate the St. Yoder Day that the Swiss people took with them when they turned Protestant. It is still listed on the Swiss Protestant calendar. Both had visited the Yoder Chapel near Grafenort, Switzerland. In 2005 James has also visited the Chapel in Gsteig, Switzerland. We did some research in the Mennonite Life issues of July, 1968 and also in the Mennonite Life issue of July, 1971. Both of these articles were by Rachel Krieder. So what started as a joke is still being celebrated on August 16, or as near as we can. We have from 15 to 20 attending from the Newton and Hesston area yearly. Anyone with a Yoder connection is invited, however remote. 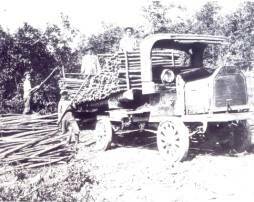 We have researched the Yoder name and we have various people report on some Yoder history. We would be interested if any other Yoder's celebrate this day. This year, in addition to the usual potluck, we asked three Yoders, all named James, to report special activities. James D. Yoder, retired psychologist, just completed another historical fiction novel, The Lone Tree, describing the arrival of a group of Russian Mennonites in Florence, KS in the middle of winter in 1874. Readers can retrace the story in Kansas by visiting the graves of over 300 who didn't survive the small pox and cholera epidemic, the marker for the historic lone tree, the descendants of the survivors, and the Mennonite Heritage Museum in Goessel, KS that has exhibits of their efforts to make a living on the prairie. James E. Yoder, Hesston College chemistry professor, reminded us that ancestors named "James" Yoder were hard to find. There were many other Biblical names used over and over but the four James Yoders of our community would have been unusual in past generations. James E. shared his experience of teaching in Swaziland under a Fulbright grant where he had taught under MCC 28 years ago. Phyllis, his wife, reported on the overwhelming problems of the HIV-AIDS epidemic in Swaziland. James L. Yoder, builder, over the last seven years supervised four building on the Hopi Mission School campus. He showed photographs and reported on the work of many volunteers. Doris, his wife, supervised cooking for the volunteers during the months donated to the projects. He also informed us that his relative, Amy Yoder Begley, had participated in the 10,000 meter event at the Olympics in China. Since he also is related to the Yoders producing Yoder popcorn in Topeka, IN for over 70 years, he provided the group with all we could eat. The "Find-A-Grave" web site allows you to: post the name and dates of your ancestor in the cemetery where he or she rests; to add his or her photo; to add a photo of the gravestone; and to post a biographical summary or obituary. Visit the site at: www.findagrave.com . Already recorded are internments for 2,750 (an increase of +494 from April) -Yoder, 71 (+11) - Yother, 20 (+5) - Yothers, 56 (+19) - Yotter, 13 (+4)  Yoter, 26 (+8) - Yoders, 4 (+0) - Ioder, 13 (+0) - Joder, 2 (+0) - Jotter family members. You can either add your ancestor to a cemetery, or post data on an existing record. For assistance write: Chris Yoder at: cyoder@tds.net . Samples of posted Gravestones are shown on this page. Jacob Yoder (1834-1884) "born in Lehigh Co, Pa." IOOF Cem., Central City, Colo. NOTE: From the census alone, he had been tentatively identified as MUA13, but the "b. Lehigh County" confuses things. Netherlands American (ABMC) Cemetery and Memorial, Margraten Limburg Netherlands. 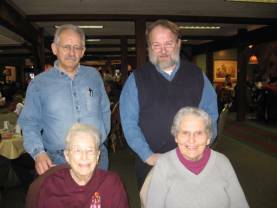 2008 MELCHIOR YODER FAMILY UPDATE NOW ON-LINE <ETH>Thanks to family line coordinator Donald Honeywell, an update has been received and posted. Many of the previously "unlinked" Yoders have now been placed. Visit:  www.yodernewsletter.org . Doing a basic 12 marker DNA test costs $101 through the Yoder DNA project. As of this time we have had 67 participants. Testing from strategically selected lines can show significant results. For an updated status of the project see the links on the Yoder Newsletter Homepage at: www.yodernewsletter.org . or by mail to "The YODER PROJECT": Family Tree DNA, 1919 North Loop West, Suite 110 Houston, Texas 77008. Among the tests in process at this time are: a second Christian Yoder (YA2) and Barbara Schott descendant; and an upgrade on the suspected OH13214 line descendant. YNL ADVISES TROYER DNA PROJECT:  It was only necessary to test 3  descendants of Michel Troyer, forebear of the Amish Troyers, to reveal  his 67 marker DNA profile. Interested Troyer descendants should visit: www.familytreedna.com and go to the Troyer project results page for details. We now have two tests returned from two different sons of Frederick Yoder of Centre Twp., Berks County (see YNL25). This Frederick is among our "unlinked". It is known that "From a tender age he was reared by his kinsman Daniel Yoder near Pleasantville" (Daniel OH111). With a test from  descendants of sons Jacob and Alfred, we can see the 12 marker Y profile for Frederick himself. In YNL 25 we speculated Frederick may have been from the OH1321-Samuel family, but he matches to none of the three Oley Yoder profiles and could not have been a son of Samuel Yoder. It seems his father may not have been a male Yoder. Nicolaus Joder, born October 5, 1673: the descendants fromWeidenthal in the Pfalz emigrated to Weidenthal in Rumania. Founded the town of Weidenthal on the Black Sea near Constanza in Rumania. Jost Joder, October 5, 1678: emigrated with his brother toPennsylvania. Caspar Joder, born September 9, 1683: descendants emigrated from Mussbach near Neustadt by way of Weidenthal, Pfalz, to Rumania. Some still living in Rumania. Barbara Joder, born April 9, 1676: ? Hans and Jost Joder founded Jottersville, Pleasantville, or Yodersville in Pennsylvania." In the YNL 41 article we weren't quite ready to claim that Melchior was a nephew of Oley Hans and Yost as there were some slight conflicts in dates, but this certainly still seems possible. Another stone from "Find-A-Grave" is that of John A. Yoder (Con61c), grandson of Conrad Yoder's son Daniel. John (1845-1902) married 7/16/1868 in Davies Co., IA to Susan Elvira Huffateter and both are buried at the IOOF Cemetery in Eldon, IA, John enlisted Feb. 24, 1864 and served in Co D 3 IA CAV during the Civil War. This photo was shared by Mary Haunreiter. It pictures Nellie Pearce Yotter, the Reverend Charles Yotter, and their son, Ronald, the first of their three children. 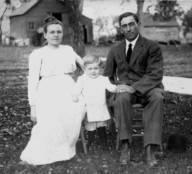 Nellie was born in 1885, in Anthon, Iowa, to Levi and Olive Pearce of Peiro, Iowa. Charles Yotter was a minister at Bethel Church in Piero around 1912. The family eventually settled just outside Chicago, at LaGrange Park, Illinois. Mary states: "They were wonderfully kind people and I have great memories of them from when I was a little girl visiting their home". Charles descends from the Yotter family in Eppstein, Germany (see YNL10, dated Oct. 1987), which descended from the Steffisburg, Switzerland Joders. AQ2b- Charles Yotter b. 11/6/1879 West Point, IA m. Nellie Pearce Methodist Minister d. 11/13/1961 LaGrange Park,IL. AQ2- Christian Yotter (12/12/1831 Sembach, Gy-7/14/1914 bur West Point,IA (obit in Christlicher Bundesbote-30 Jul 1914) m1 Katherine Boyer (c1837NY- ) m2. 1862 Sarah Schmidt (1842 GY to US age 3- d. 1924 Mt Pleasant,IA, bur. West Point, IA . Christian left GY to escape the draft 1850 to Erie Co, NY.. arrived with brother Henry 30 Oct 1850 NY, NY on ship Wm. Tell. Naturalized 21 Aug 1860. in Lee Co, IA by 1860 (with w2 had 15 children only 10 listed survived) (References: D. Maszaros data; 1860 Census, Lee Co, West Point)." Heinrich Jotter II b. 1777 Eppstein, Gy m1 1803 Maria Krehbiel (-- -8/24/1807) m2 1808 Catherina Krehbiel (1779-10/27/1826). Resident Eppstein. Heinrich Jotter I b. 1750 Eppstein, Gy. m1 Maria Krehbiel m2 Veronica Rohrer of Eppstein, Gy.--d 1828 Eppstein. Lived house No. 19 in Eppstein. 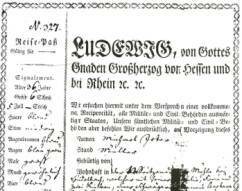 Christian Joder--b 3/20/1687 Steiffisburg, Switzerland m his cousin Margarete Gerber. Living in Eppstein by 1714. From the left, Howard Beuary in front of truck, Raymond Yoder in the cab, standing on the truck is Stanley Yoder, Al Yoder (OH1331bb), Charles Yoder, Norman Yoder. 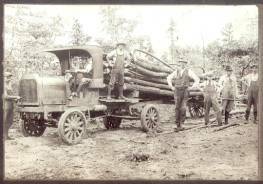 These photos of the Albert L Yoder, Barry Twp., Schuylkill County, PA logging business were taken in 1918. (photo complements of Al's great-granddaughter Peggy Stauffer, Willow Grove, PA). Albert L Yoder (1860-1923) is buried at Salem United  Methodist Church cemetery in Mabel, PA. He was also a well driller. His wife was Saloma Arnold (1863-1945). The YNL will publish Yoder related inquiries or exchanges at no charge. Send Queries to: Chris Yoder, 551 S. Maple St., Saugatuck, MI 49453 or email at cyoder@tds.net . Over the years, the YNL has traced the political adventures of John Yoder of Harpers Ferry, West Virginia. In YNL17 we covered his race for the US Senate against Jay Rockefeller, and in YNL21 we were able to report on his first successful race for the state senate. "Attorney Born January 9, 1951, in Newton, Kansas, the son of Gideon G. and Stella H. Yoder Education B.A., Chapman College; J.D., University of Kansas; M.B.A., University of Chicago Affiliations Member, West Virginia State Bar; District of Columbia Bar Association; Indiana Bar; Kansas Bar Legislative Service Elected 1992; 2004 Legislative Positions Held Minority Whip, 71st Legislature Other Public Service District Court Judge, 9th Judicial District, Kansas, 1976-80; Supreme Court Fellow, Supreme Court of the United States, 1980-81; Special Assistant to the Chief Justice of the United States, 1981-83; Director, Asset Forfeiture Office, U. S. Department of Justice, 1983-84; Vice-President, United States Supreme Court Fellows Alumni Association, 2006-2008 Religion Mennonite." "Yoder mine is located about 1 mile east of Grantsville. It is a drift opening working the Freeport coal seam. Ventilation is by natural means." 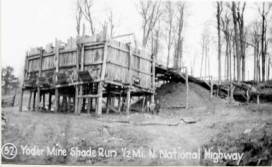 "During calendar year 1924, this mine employed one man, worked 10 days and produced 24 tons of coal." Paul H Yoder of the House of Yoder writes: "The e-mail about the Yoder Mine intrigued me. I spoke to Kenneth Yoder, thinking he may have a clue. He mentioned Sam U Yoder as having mined coal at different places. I spoke with his son Noah this morning. Noah knew that his father owned a property at Little Crossings (which is just east of Grantsviille.) but he did not know of his  operating  a mine there in 1924. Kenneth knew that Sam  was into a number of mines while he was also farming the home farm north of Grantsville. So Sam U Yoder (deceased) is the best clue I could give at this time, as a possible operator of the Yoder mine 1 mile east of Grantsville." Many thanks to Tom Daniels of the Jonathan Yoder family for placing an online tour of Yoder, Oregon on the internet at:  http://jonathanyoder.com/JSYoderHistoricalTour.htm . He has also included family history and photographs, as well as reunion news!! -- Hubert A. Yoder, of Charlotte, NC died June 7, 2008. The son of the late Robert Lee and Mary Jane Heavner Yoder, and a  descendent of Conrad Yoder and Dietrich Heffner, who were among the first settlers of present day Western North Carolina, having arrived in the early 1700's. He was past president of the NC Genealogical Society, a past president of the Yoder Reunion Association, and a contributor to the Yoder Newsletter. It was through his efforts that much documentation was gathered on the Conrad Yoder family in Iowa. (Seen YNL 16), and he was an early supporter of the Yoder DNA Project. As historian of the Heavner family of Lincoln County, he compiled the book, Dietrich Heffner and His Descendents, 1723-1971. -- Abe S. Yoder, 93, died June 3, 2008 at Valley View Haven, Belleville, PA. He was born on April 9, 1915 in Belleville, PA, the son of Abe S. Yoder, Sr. and Salome (Zook) Yoder. --Bessie King Yoder, 102, of Kalona, IA died Aug. 2, 2008. She married Herman Yoder on Aug. 4, 1931, at her parents' home. --Rev. 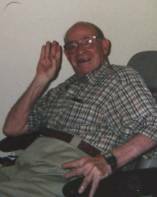 Ivan E. Yoder, 79 of Belleville, PA died August 03, 2008, at Valley View Haven. He was born on March 22, 1929 in Belleville, the son of Jonathan A. (YR2536271) and Elsie (Kauffman) Yoder. --Paton Wesley Yoder (YR162a225) 96, (Mar. 9, 1912-Aug. 3, 2008)  was born on a farm about half way between Goshen and Middlebury, IN, to Silvanus and Susan (Troyer) Yoder. He married Hazel Marie Smucker on June 14, 1936 in Goshen. She survives. A graduate of Goshen College and Indiana University, Mr. Yoder taught American History for 40 years at Northwestern Junior College in Iowa, Westmont College in California, Taylor University in Indiana, Hesston College in Kansas, and Malone College in Ohio, retiring in 1977. He also authored and published Taverns and Travelers; Inns for the Early Midwest and Tradition and Transition; Amish Mennonite and Old Order Amish, 1800-1900. He co-authored Proceedings of the Amish Ministers' Meetings, 1862-1878 and published articles in Mennonite Quarterly Review, Pennsylvania Mennonite Heritage and Mennonite Historical Bulletin. --Director and Oscar-nominated screenwriter Fred Haines died May 4 in Venice, Calif., after a lengthy battle with lung cancer. He was 72. Fred was a descendant of the Conrad Yoder Family in Ind. Greetings from Pennsylvania! The Oley Yoder Group hosted our annual Family Reunion on Saturday, July 19, 2008. We met at the firehouse in Oley for lunch and a variety of activities. Our president, Joe Yoder, called the meeting to order and introduced our guest John "Butch" Imhoff, who entertained us with songs and stories. Butch is a local folk singer performing in various venues in the area including starring at the Kutztown Folk Festival. He sang and played his guitar presenting a wide variety of music ending with a sing-along of many old favorites. Joe continued our meeting with prizes to the oldest and youngest attendees, Colonel Harry Yoder, 92 and Amy Balderama, 18. Then several members shared their experiences as members of our armed forces who had served in a variety of wars. A special THANKS to all who shared their memories with us. We appreciated not only their brave service to our country but also their willingness to talk about it with us. We ended the day with a raffle of a variety of special packages. Winners were chosen from tickets purchased and placed in baskets for each raffle item. Everyone went home with a special Oley Yoder "Macram? Weather Forecaster" as a remembrance of the day. Finally we would like to thank everyone who helped in making the day a success. We appreciate those who donated raffle gifts and those who donated their time and effort. We also want to thank the attendees, who came from far and near to join us for the day. We couldn't do this without you! 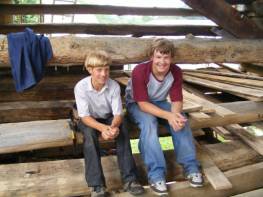 A special thanks to all of you who donated to the Oley Yoder Heritage Association. The monies will be used for the continued support of our association and its activities, including historical research, work in genealogy, and upkeep of the Pleasantville Cemetery. 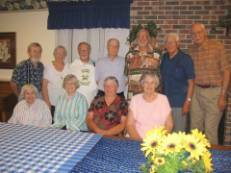 The 58th Reunion of The Conrad Yoder Family was held August 10, 2008, at the Zion Evangelical Lutheran Church south of Hickory, NC. President Phillip Yoder, of Newton, NC, presided. A delicious covered dish meal was enjoyed by 64 attendees in the Zion Parish Building. Former president Ted M. Yoder, of Newton, thanked Willie A. "Bill" Yoder for overseeing the mowing and upkeep of the Conrad Yoder Cemetery. 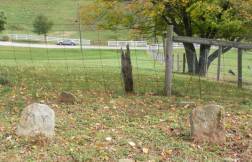 (The cemetery is  located on the Hickory-Lincolnton Road (C.R. 1008), two miles south of Zion Lutheran Church.) Another former Yoder head, Rachael Hahn Kennedy, of Charlotte, NC, expressed sentiments of several family members who believe that we must educate and train our younger folk to learn and preserve their family heritage. Phillip Yoder announced the death of Hubert A. Yoder, of Charlotte. Brief memories shared by several attendees recalled the former family president who investigated the Jacob Yoder line who left NC ca. 1815 and moved westward. Hubert served as president of the local family during the early 1970's. It was decided to move the reunion back to Grace Lutheran Church near Newton, where in the early 1950's the family began meeting the second Sunday in August. Dr. Larry Yoder is pastor of the congregation. It was announced that Chris Yoder, Editor of The Yoder Newsletter will give a program next year about Yoder DNA research. It appears that most American and European Yoder families are "genetically related." It was revealed that a mural at Oakwood School in Hickory depicts many of Catawba County's founders and leaders, including immigrant Conrad Yoder. Bill Yoder, chairman of the Yoder Book Fund Account, commented on the fund and the need to revise the NC Yoder history. He mentioned that a national reunion is planned   in 2010 in the Oley Valley in Pennsylvania. A tour of Germany, France, and Switzerland is also scheduled in May 2009. Nathan Yoder, of Regensburg, Germany had come farthest to attend the reunion. At 50 years Mr. and Mrs. Jerry Yoder had been married the longest. Jonas Weidner, four months, was the youngest attendee. Mrs. Betty Dietz Canupp, 80, of  the Mountain View area near Hickory was the senior member. A first time attendee was Dan Torchia, of Kansas City, Kansas. Dr. Larry Yoder led a memorial service in honor of deceased members of the family. Kristen Webb, of Mount Gilead, NC, provided piano accompaniment for the service as well as at the beginning of the reunion. Bill Yoder, Phillip Yoder, Mary Yoder, and Michael Huffman attended an informal worship service on Saturday evening in the Old Yoder Cemetery. Huffman decorated the memorial with floral tributes.--- Respectfully submitted by Neal D. Wilfong, secretary.